In a post-earnings conference call, Activision Publishing CEO Eric Hirshberg said that work is already beginning on the second game in the “Destiny” franchise. “Work has also begun on future expansion packs as well as on our next full game release,” Hirshberg said. He didn’t provide a launch date or any further details about what to expect. The first expansion pack for “Destiny,” called “The Dark Below,” will be released on Dec. 9. Activision posted better than expected earnings for its third quarter. Revenues were $US1.14 billion, compared to $US657 million for the same quarter last year. Earnings were 23 cents per share, compared to analyst expectations of 13 cents. And that’s thanks in large part to “Destiny,” which came out in September. 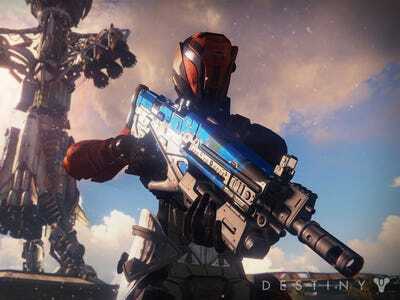 In a statement, Activision Blizzard CEO Bobby Kotick said “Destiny” was the “biggest new video game franchise launch of all time.” It now boasts 9.5 million registered players, who are playing the game on average more than 3 hours per day. Business Insider’s Dave Smith played the game for 5 hours, before the full version was even released. Activion Blizzard is also looking at “Call of Duty,” which was released on Monday, to boost its revenue for the next quarter.